Our relationship with Financial Symmetry started in 2014, where we worked on and got familiar with their in-house, custom-made tool, started and maintained by the company’s owner back in the 1990s. The system has grown over the years and is part of every advisor, service, and intern role in the company. 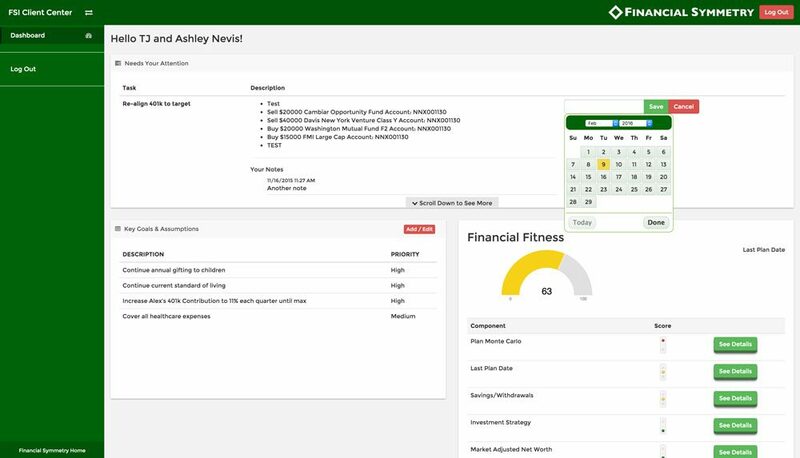 With all of this data, and to provide additional value to their clients, Nevis Technology was commissioned to build a custom Client Center Dashboard that integrates with their legacy in-house system. 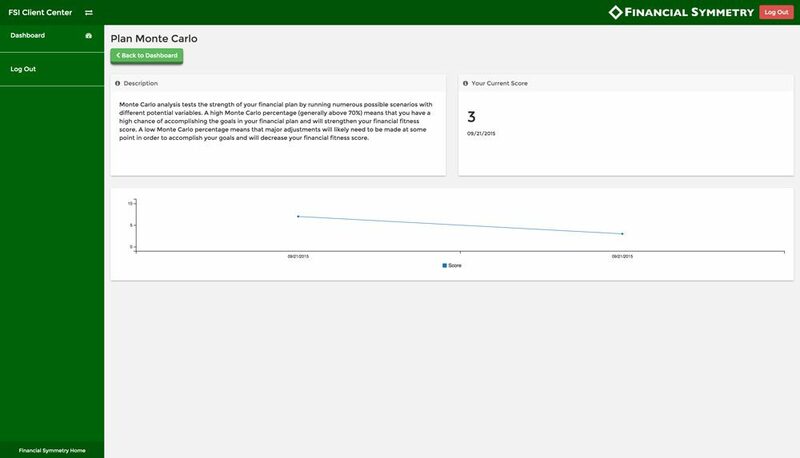 One of the main elements of the Client Center was to have the client interact with advisor recommendations electronically. Their previous process required their clients to mail, email, or call them after receiving their mailed recommendations. 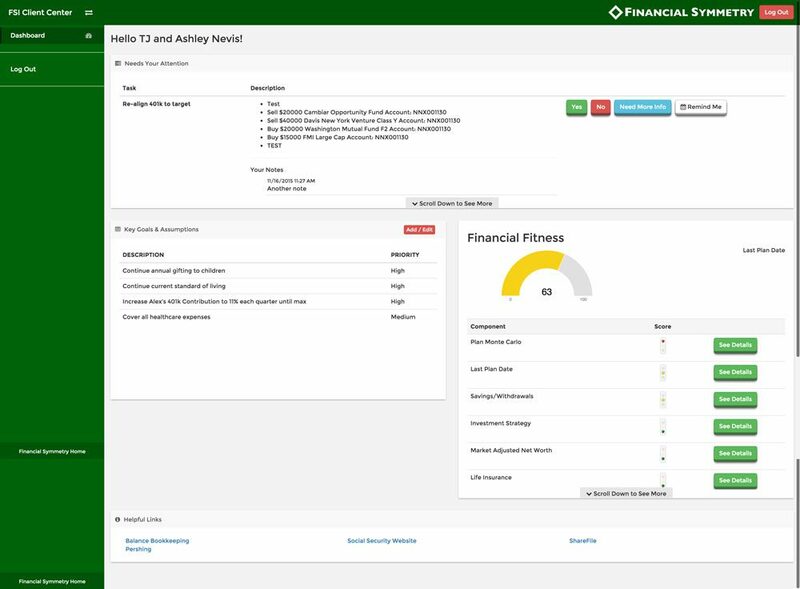 The Client Center allows for more than just approving and rejecting recommendations, clients can also initiate a conversation with their advisor team, see their “Financial Fitness” statistics (which is a proprietary calculation on their financial plan success), and add and edit goals that the team can take into consideration when preparing their financial plan. Their client can use a “Remind Me” feature which hides the task until a future date that they’ve set – this helps prioritize what needs to be done. 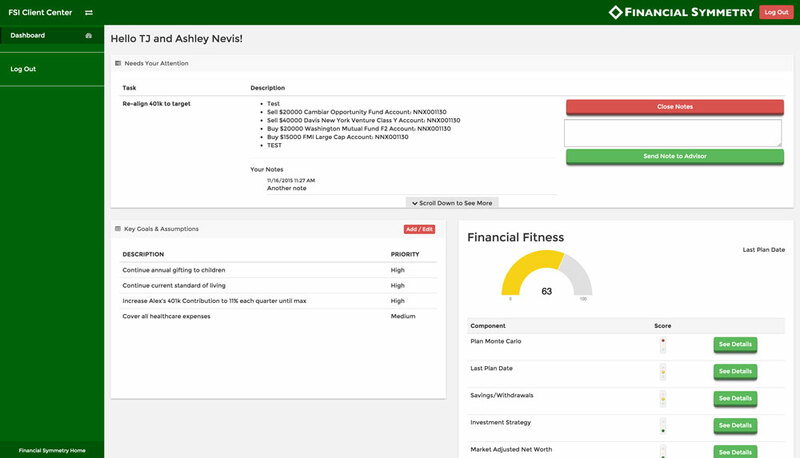 The client can review the details page of each element of their Financial Fitness. In this phase there is limited data, but there is more information about the element and how it affects their score and financial plan, and there’s a chart of their historical scores. We’re excited to continue developing this product for Financial Symmetry!